On May 23, NASA’s Aqua satellite captured a visible light image of Mekunu. 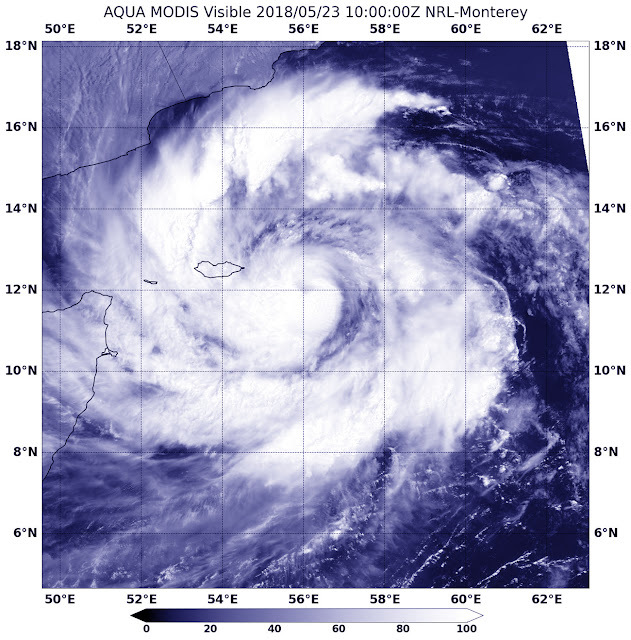 The image showed the low-level centre of circulation southeast of Masirah Island, Oman. A band of thunderstorms in the western quadrant stretched over the island and skirted Oman’s mainland coast. Eight people were missing and hundreds of others evacuated from their homes as Cyclone Mekunu hit Yemen's island of Socotra on Wednesday night. Four of the missing were crew on board a boat that sank in the Arabian Sea and are suspected to be dead. At least three vessels have gone off the radar, a source told The National. The cyclone has caused severe flooding and damage to houses, bringing with it strong winds and thunderstorms. "The situation is extremely critical," said the former governor of the island, Salem Abdullah Al Socotri. "The roads are flooded, and we cannot get out of [the northern coastal town] of Hadibu to see what is going on in other areas of the island. Also, the strong winds have intercepted telecommunications, so we are almost isolated." Mr Al Sacotri said the operations and control room in Hadibu received information that a cargo ship sank about 80 kilometres off the shore of the island. "According to our data, the ship was coming from Mukalla, and we still don't know whether or not the crew survived," he told The National. The homes of some residents in Socotra have been completely destroyed after the cyclone hit the island. "Some families who had to evacuate their homes have gone to mosques and schools for shelter because their mud-built residences had collapsed, the structures were not strong enough," Abdulrahman Juman, a Yemeni activist and volunteer, said.